I know these items as “sleeveless denim jackets” because in English-English a vest is an item of underwear. But in the US these rugged little darlings are called denim vests. So be it! I just became more American. 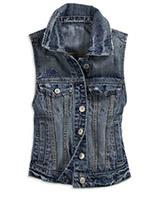 Denim vests are extremely versatile because they function like denim jackets sans the sleeves. Their ventilating advantage is a great idea if you’re after the visual effect of an extra layer without quite as much warmth. We often leave off our jackets in Summer because it’s too hot. 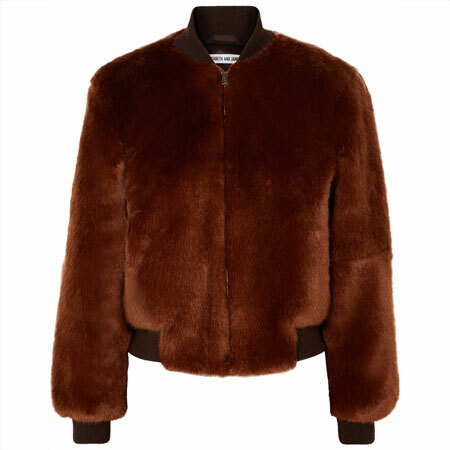 But by leaving off our jackets our outfits can lack the edge or arty interest that the right jacket provides. A denim vest is one solution. I like denim vests best in stonewashed blues because that’s when they look the most rugged. But they are lovely in white and black denim too. Wear them over dresses and with breezy skirts, with white or black jeans, clamdiggers or shorts, harem pants, cargos, pencil skirts – you name it. Every gal needs a denim jacket or denim vest. The item has the genius ability to dress down just about anything and add the perfect cool vibe. Love the look over a sleeveless top or dress too. Forum members Greenglove, Chewyspaghetti, Louise, Tanya and cciele rock their denim vest outfits in this thread. Very, very fab. My wonderful friend Lori, who lives in hot Los Gatos, CA, bought the hinge denim vest on sale from Nordstrom when we went shopping together a few weeks ago. She looked sensational in that vest! I love this look! Perfect polish for summer. I need one, now! Yes! These are genius, Angie. I bought the Hinge faded denim vest to wear over my summer dresses, and it is very lightweight, and cropped, so it works perfectly! I’ve been wanting that Hinge waistcoat for far too long. It probably is a sign I should buy it, right? I’ve been admiring these in the stores for a couple of months. Now that it’s really getting warm I might have to take the plunge! How does the sizing run on the Hinge vest? I´m a bit torn here. On the one hand, they make great outfits – Tanya, your ensemble is killing me!! – on the other hand I don´t like the rugged versions and I don´t like them styled with bare arms – too much of a rocker outfit. Maybe I´ll find one in a very dark washed blue or black. The Hinge vest runs somewhat big. I am in an XS and it is still roomy. I wear my vest constantly- it is a perfect thing to throw over a fitted T or tank. I am happily wearing it with denim which makes it so much easier now that denim on denim is not bad style. In English-English I think we would call them waistcoats. The forum ladies look amazing in their denim vest outfits! I don’t have a rugged bone in my body, but I do like the darker wash denim vests. I’d be interested to try one on and play around with styling it. Fun look! Angie, can a broad-shouldered, inverted triangle wear a vest that’s cut as squarely in the shoulders as the ones above? My experience has been that sleeveless button down shirts that are cut squarely in the shoulders like the vests above are not always a flattering look on me. But I’m sure there must be denim vests out there that are cut so the eyes are drawn inward toward the neck and away from the shoulders, because I’ve certainly seen vests in other fabrics that are cut that way. I am not taking to these. Maybe “rocker chic” is a style I found hard to appreciate! Phoebe and Marianna, I had no idea you weren’t into rugged looks. Frances, if the vest is tailored enough, you’re fine. I also have the Hinge vest and I adore it! 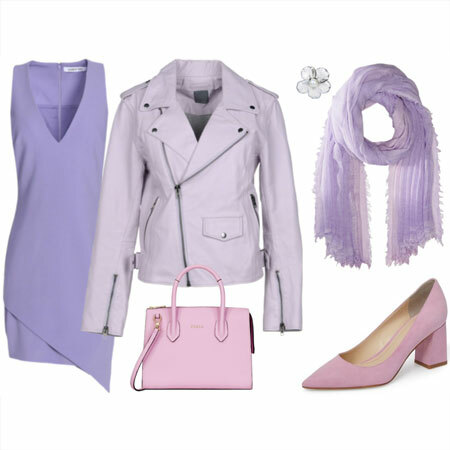 Definitely great for layering in the summer. I think it runs on the large size, but I wouldn’t say a whole size up. I wear S or M in tops and have the vest in S. It’s a little snug if I button it up, but I rarely do that. LOVE the look. And now, after looking at all these killer outfits the gals posted, I’m totally bummed that I didn’t go for the vest myself. I ordered the Levis one and was so excited about it, but when I tried it with a dress of mine it just didn’t really work. Not sure why, but I returned it. And now I look at all these super cool outfits and think I should have tried harder! You all rock these, and the vests just exude a really neat vibe. my shopping ban may have to be postponed. I’ve been admiring them on the forum gals… I like that hinge one. I would like the Levi’s one if the buttons weren’t copper colored. It has been quite some time since I owned a denim vest, and perhaps part of me feels like it is reliving too much of the past. BUT, I also love the idea of it as sort of a rocker piece. I’m interested in trying some on! I love the posts of the girls wearing theirs! 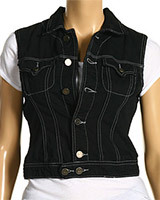 I have the Hinge vest on order from the YLF store and can’t wait to get it. Pairing it with a LBD as some forum members did especially appeals to me. Angie, your idea is genius for layering in hot weather. Thank You!! Holy Macguyver! No thank you! This is one of the many reasons I love YLF. I never, ever would have considered buying or wearing a denim vest until I saw this post and saw the different ways that members styled them. It’s not an item I’m drawn to (not much into the rocker-chic look either), but members have really shown the versatility of this kind of vest. Angie, this post has made me ponder the different words we use to describe a look. I used to equate edgy with rugged, but now I’m thinking that a look can be both edgy and polished, but not rugged and polished. Maybe rugged is the more casual version of edgy? What do you think? Additionally, it’s encouraged me to take a closer look at my philosophy on layers. (And to realize that I even have one!) Having lived in a variety of places where the weather outside varies drastically from the temperature inside, I’ve stuck to outfits that don’t need layers to achieve the look I’m going for. 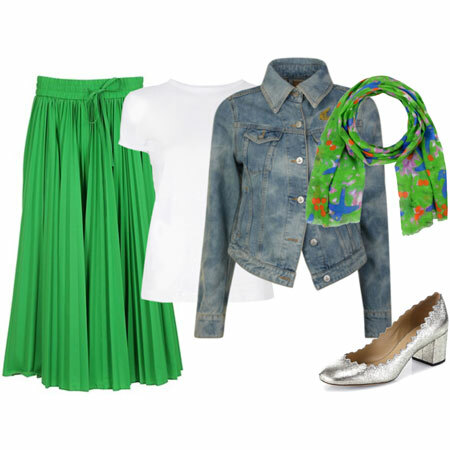 To put it differently, if an outfit needs to be dressed up or down I try to do it with items I know I won’t be removing. For example, I don’t want to find myself in a situation where it’s too hot to keep my vest on, but if I remove it I’ll suddenly appear over-dressed. Instead, I want all of my layers to have about the same dressy-ness as my foundational outfit. So while I appreciate the denim vest look, I probably wouldn’t feel comfortable wearing it with an outfit that wasn’t already very casual, which is a look I’ve personally been moving away from. Does this make sense? I wasn’t a fan of denim vests until I saw how some YLF members rock this look. But I find square shaped items don’t work too well on me. I wonder if they make any denim vests in a slightly shaped style, where it cuts in to define the waist a little? I would be interested in trying out the look with that style in a dark wash or black. Kate, it’s often handy to be able to dress down a garment as it increases it’s versatility. I personally love to mix dressy pieces with ultra casual ones. I find the contrast very appealing and interesting. Edgy does not necessarily imply rugged, rocker or unpolished. It’s a look that is “on the edge” of fashion, if that makes sense. 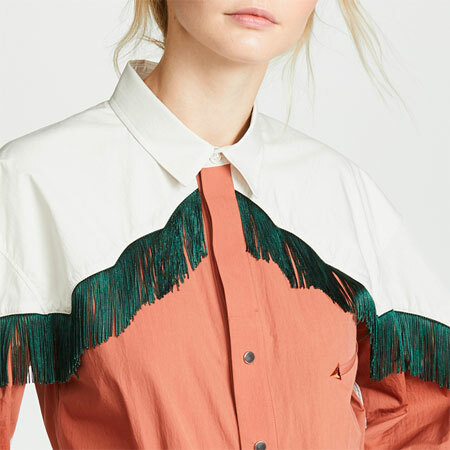 A little fringe. Not that mainstream. Lisa, these vests are actually more tailored than you think. Thanks for the post! I bough a black denin vest and don’t know how to use it.. I got this one in the beginning of the summer and I am getting lots of use from it. I like it that it looks more like a blazer without sleeves than a traditional denim jacket without sleeves and it fits a generous chest very well, which I usually have a hard time doing. I’ve worn it with a tank top and flowy skirt, a printed blouse and walking shorts and a couple of casual dresses. Love It! Wow I adore the way the jcrew vest is styled….I think this look has officially won me over, as of course has seeing the ylf-ers sport them!! I think I’d still prefer a darker wash like the Levis trucker one or the Siwy vest (although not for $195). These waistcoats or sleeveless jackets are very appealing but I really need a denim jacket before I buy a modified one. If only I could stretch my budget just a little further? I like the Siwy vest on the bottom right because it looks longer than the rest, and less boxy, more curvy. I always think I need longer tops, vests, and jackets, rather than shorter ones because I am long in the torso. Am I right on this, or delusional? I have been collecting summer vests made of cotton, silk, linen, cool weather fabrics, even leather, but no denim vest yet. 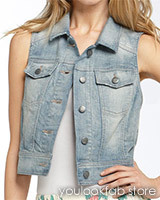 I really am stuck on thinking all denim vests are all boxy. I used to have one from Eddie Bauer years ago that I just couldn’t wear. 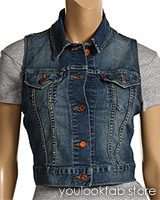 I’m still looking for the perfect denim jacket – but I just added perfect denim vest to my list as well. Thanks for the forum members for inspiring photos of this look! I like the look a lot so I am on the lookout for one as well as denim jacket. Angie, is this the only style of the denim vest you recommend or there are other styles which do not look outdated out there. I was looking for the vest in the thrift stores so far without any luck for the style you shown. Which components will make the denim vest to look modern and not old fashioned? I think you make a convincing argument for why a denim vest would be useful in a wardrobe BUT, like Rosie, I can’t help feeling like I “rocked” this look as a 12 year old and I just can’t go back. I wouldnt feel fab wearing one. Vests, in denim and in other fabrics, are also great for those of us wide-shouldered, long-armed gals who have a difficult time finding jackets that fit. What I love about vests is that they’re incredibly comfortable, but still provide some structure and interest like a jacket does. My Ralph Lauren denim jacket fits through the torso just fine, but is not very comfortable through the shoulders, and is definitely too short in the sleeves–so I wear them rolled up. I think that a denim vest would be a good substitute for it. I also like vests for the reason that Angie mentions–that they make a great top layer in hot weather! I’m eyeing that Levi’s trucker vest in the YLF store. I love how it looks like it nips in at the waist–it’s not boxy looking at all. There is definitely ample guidance in the blog and inspiration in the forum for styling denim vests! But I think I’m going to run into the same problem I did with denim jackets: They are all too long. I measured the ones I have (which are both too long), compared them to my pleather moto jacket (which is the right length) and realized that I need one that is around 16″. The ones I see described as “cropped” are all a good 19″ long. No wonder I’m having so much trouble. Maya, how about buying a vest in a petite size? After seeing the ladies model, I am sold on this look and plan to buy the Hinge vest. Not sure about the size…feedback seems to be that it runs small…so I’m thinking a small. Thank you for an inspiring post. I am definitely convinced now…I’ve been stalking denim vests on eBay for a few days and I’m gonna take the plunge – love this look! I think it would be a great look if you lived somewhere where summers aren’t quite so hot. It’s so hot here that the idea of wearing anything extra (even a cami) makes me sweat even more. And we don’t have AC. So I’ll pass on this one. 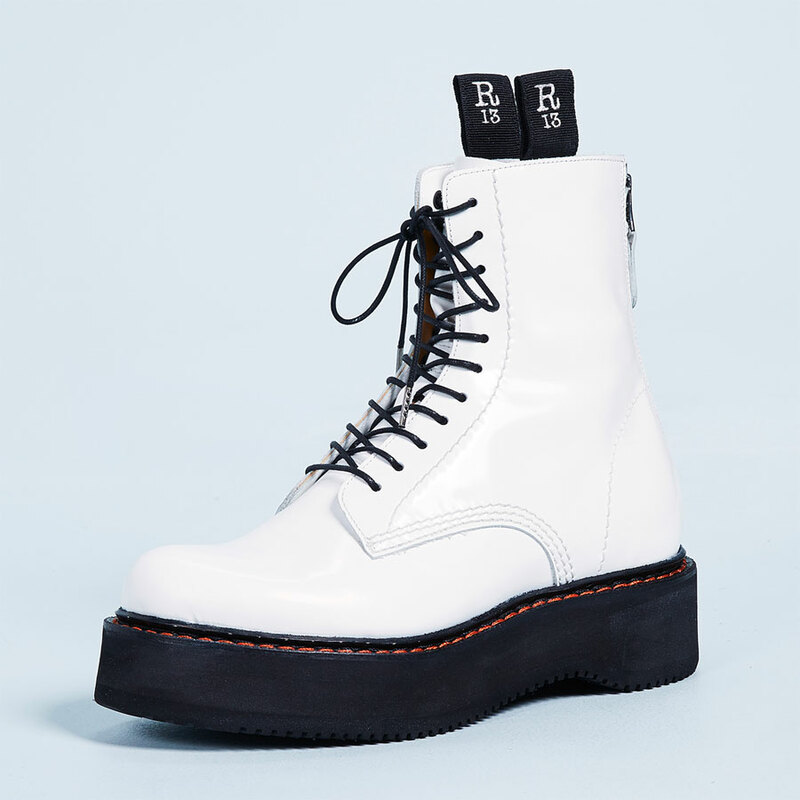 It’s like summer boots – fine if you live in Seattle but not so great if you live in a place where the temp is often over 100 degrees during the summer. My Hinge vest arrived and I’m completely satisfied with it. In our hot humid Midwest weather it is cooler worn open over a tank than a tee would be because it’s sleeveless. Today it’s popped over a black tank with black INC slim cargo clams and pewter wedge sandals. It does a wonderful job of lightening up black for summer. I can’t get into these, but I’ll try to keep an open mind. I’m in an area where you might see a denim vest on a trucker or a hunter, so it’s hard for me to translate them into high style. Then again, I love my denim jacket so it’s not so different. Kristine, I feel that way about cowboy boots. I live in an area where they are worn by ranchers and workers or country western types. I do not like denim vests/waistcoats, – sorry. Far too butch for me. I honestly don’t know how to wear these vests. Gotta check out that thread. I am a fan. I own a black denim moto style one and am seriously considering the Hinge one as well.